Reviewed by expert skiers who say that the book is spot on. 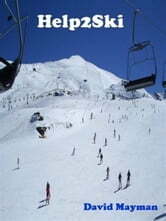 Used by beginners who have confirmed the book definately assisted and sped up their skiing progress. Highlight was when a family I had taught to ski, 2 adults and 3 children, presented me with a card that the children had drawn themselves thanking me for teaching them to ski and the enjoyment it brought. My method of teaching is Keep It Simple so you will not find any technical jargon such as Directional Rotation, Flexion and Extension. What does this all mean? How does it help your skiing? This guide is in plain English and easy to understand bite size chunks. I will take you from been able to ski in a straight line to carving the piste leaving those enviable train tracks behind you. There is no right or wrong method to skiing therefore I will offer you alternative techniques where necessary. If one technique does not work then you can try another. If you are starting your skiing career then I would recommend arranging private lessons setting yourself a goal for each private lesson as to what you want to achieve, sharing this with your instructor. A word to the wise though do not set yourself any more than 2 stages in one lesson for the first four stages. On a group lesson each stage will take at least an hour to complete, reading the stages you want to complete before you go on your lesson in conjunction with a private lesson could potentially halve this time therefore saving you money. Although as individuals we all learn at difference rates so do not be disappointed if you do not achieve your goals as quickly as you were hoping for.